I don’t know about you, but when I think of summer, I picture blue skies, sunny skies, and rainbow skies. Sounds like the perfect combination, doesn’t it? Summer is also a great opportunity to take your little one outside and expose him and her to a whole new world of nature. Whether you’re going for a peaceful walk in the park or splashing around in the pool, you’ll want to make sure your baby’s head is protected from the strong sun. Since children have extremely sensitive skin, it’s important to make sure they’re dressed appropriately for the outdoors and that’s where summer knitting patterns work in your favor. 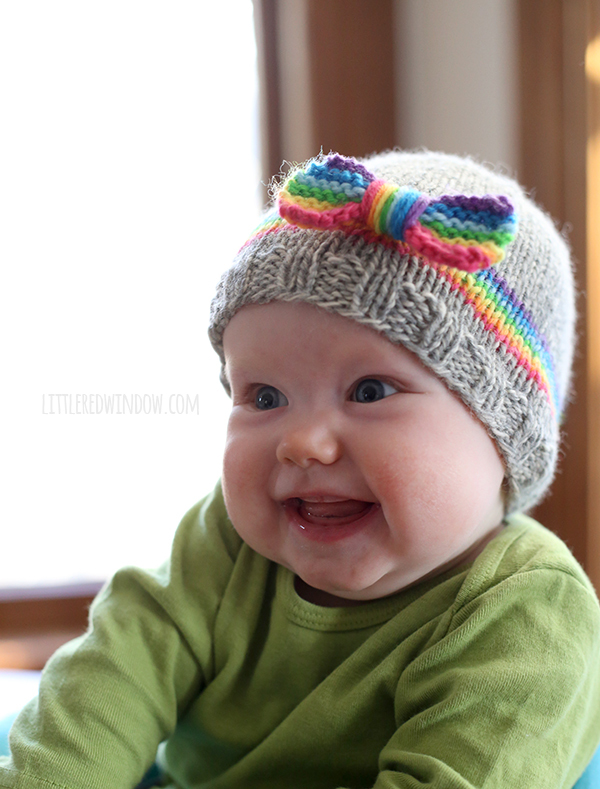 This adorable Rainbow Dreams Baby Hat by Cassandra May of Little Red Window certainly does the trick. In fact, this free baby knitting pattern is almost too cute to handle! The rainbow bow is perfect for summer and this pattern can be easily adjusted to fit any tiny tot in your life. If you’re attending a baby shower in the near future, give mommy-to-be a handmade knit gift she is sure to cherish for months and years to come. Forget about trying to decide which color yarn to use, because this playful knit baby hat incorporates all the delightful colors of the rainbow. Your baby will love wearing this precious hat when you embark on all your summertime adventures and you will love seeing the sweet smile spread across your son or daughter’s face. What are your favorite things to knit in the summer? Your site has to many unwanted adds that keep popping up when trying to get pattern so I am leaving this site , I have tried 5 times & was bombarded by so many adds it was aggravating .